Phish's acclaimed multi-CD Live Phish series contunues to be a remarkable success. Now, Phish and Elektra are pleased to announce round four of Live Phish, consisting of four complete, multi-CD concert albums. 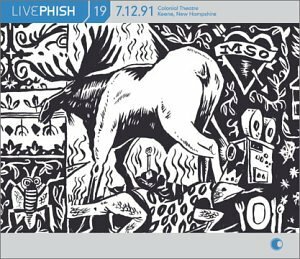 In this latest batch, the selection was done by bassist Mike Gordon, after reviewing 20 years of personal journals, most of them commentary about Phish shows. Using his notes as a guide, he whittled down the list of 1,236 candidates -- that's the number of Phish gigs between 10/30/83 and 10/7/00 -- to a manageable 50. He halved that list to 25 and then further excised it down to ten, before making a final deselection of four "Mike's Picks." As a bounus, two of theses sets include extra live tracks from additional shows. These releases feature the innovative, much talked-about packaging, as well. This is the ultimate collectors' series for Phish's diehard legion of fans.